This is a great option if you’re using a pedometer or a different method of tracking your distances. 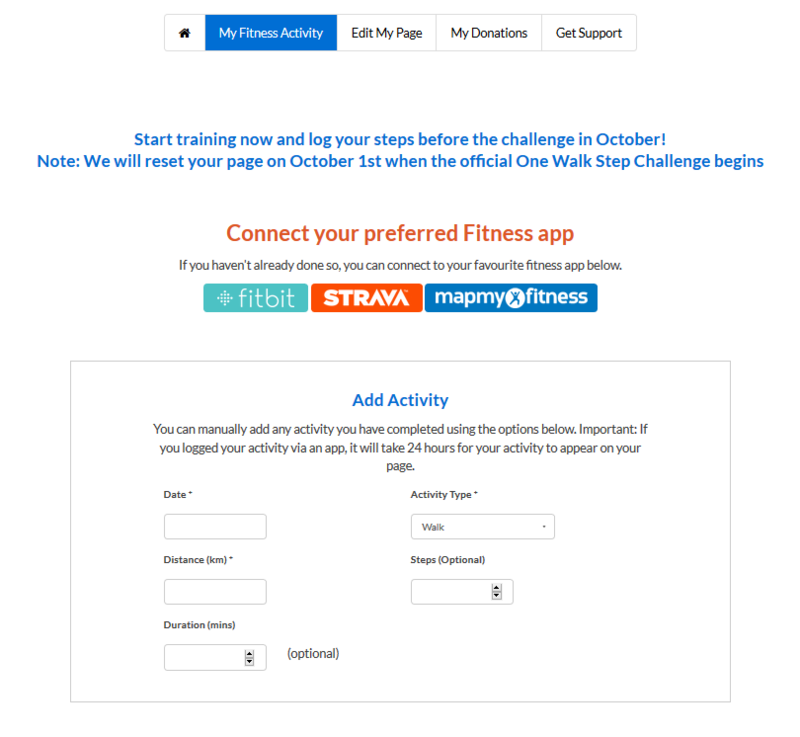 Your steps / kms will be added to your fundraising page to track your progress throughout the month. If you track your workouts with Fitbit, MapMyFitness or Strava your distances will automatically add to your tally. Then, once you’ve connected your app and start your next workout. Select ‘start your workout’ in the app (on your phone). Once you end your workout, save your workoutand then your activity will be published and displayed on your fundraising page the following day. If you have synced your app already but it is not working, please log in and re-connect it. When using Fitbit, you must ‘start’ an activity and ‘SAVE’ it or your daily steps will not automatically add to your page. If you are having issues, try syncing through BOTH your Fitbit and the Fitbit app on your smartphone. When using MapMyFitness, you must ‘start’ your workout, ‘stop’ your workout and then ‘SAVE’ your workout. Your tally will be updated each day (with the previous day’s distances).